I’ve always loved Alexander McQueen’s heart-shaped peep toes, but one thing I DON’T love is Alexander McQueen’s price tag, so I’m always happy to find a more realistically-priced alternative, such as these China Girl heels. 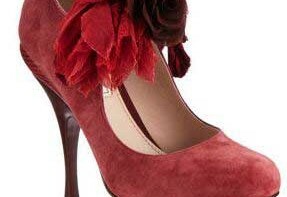 These are £69.95, and have real suede uppers, available in red, mint, cobalt and black. A tough choice, I’m sure you’ll agree. Now, personally I think shoes with hearts are all kinds of awesome, buy they CAN be a little bit “twee” sometimes, so one of the reasons I like these is because they’re such a subtle way to include hearts on shoes. At first glance, or from a distance, they look just like an ordinary pair of peep toes: it’s only when you get up close you realise they’re anything but. Personally, I’d get the Cobalt. Though at that price point, you could choose 2 or even all of them. Great looking shoes, fun, practical and beautiful! Blue or maybe the red, which actually looks more orange on my screen and therefore more appealing. Bit hard to go past the mint version, however.